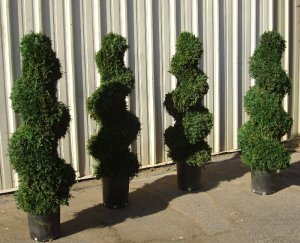 Our hand-sculptered Spiral Junipers have solid, dense foliage, indicative of an authentic full-bodied sculptured spiral topiary as found in the world's most prized sculpted gardens. There is no exposed skeleton wood. Made from preserved Rocky Mountain Juniper. An excellent feature plant for foyer entranceways and corriders, residential and commercial. Retail Price: $ 565.00 (5 foot ovh).